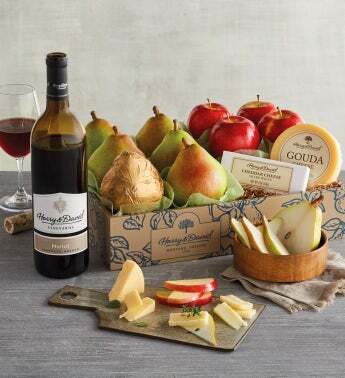 Our Classic Pears, Apples, and Cheese Gift is a great gift for sweet and savory snacking. Juicy Royal Verano® Pears and premium apples are tasty companions, along with sharp white cheddar and Gouda cheese. This gourmet gift of fresh fruit and cheese is a wonderful choice for appetizers, for a picnic, or with a glass of your favorite wine. Arrives with a bottle of Harry & David™ Merlot.